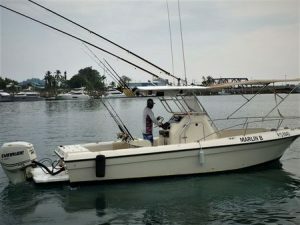 This new 26-foot Center Console powered by a G2 250HP Evinrude outboard is out of Pez Vela Marina in Quepos. Experienced Captain Merlin Badilla is at the helm. It is fitted with an awning for ample shade, and has a marine head. Its wide range of light and heavy tackle fishing gear is all Penn International and Okuma, with an ample variety of teasers and lures. She carries a Garmin GPS SI-TEX sounder and an ICOM VHS for electronics, as well as all the required safety equipment.